Here I am 3 weeks into the recovery of My right rotator cuff. I’m doing really well and continue to be free of pain. How lucky can a girl get? 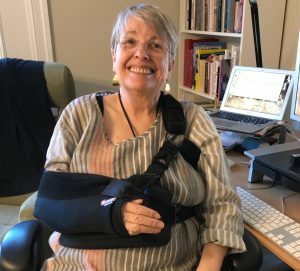 That’s not to say that living in this sling is easy. Needing help to take a shower, get dressed, and fix a meal aren’t things I’m familiar with. I don’t want to spend the rest of my life depending upon everyone else, but if that became a necessity I’d have to adjust, and could be a better person for it. For me the biggest downer has been not being able to use my right hand to communicate. 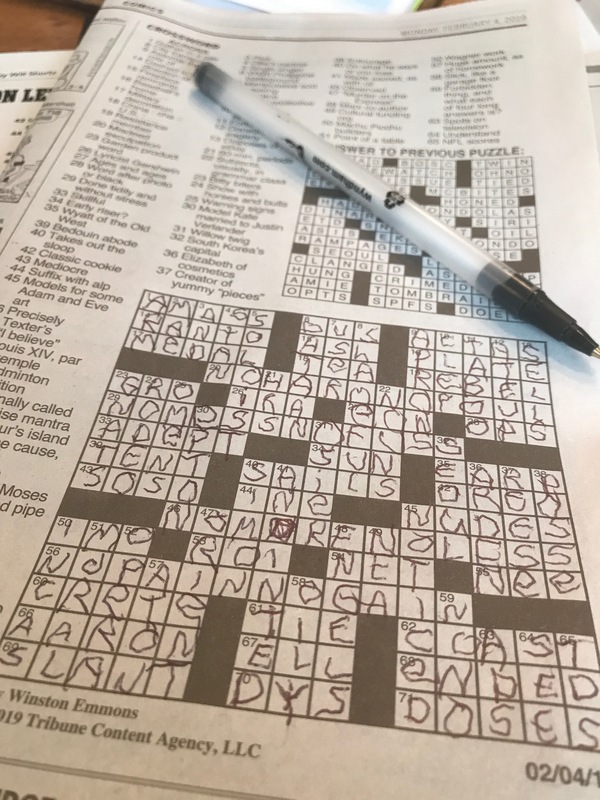 On day three, I attempted to do a crossword puzzle with my left hand. Although I finished the puzzle it was unreadable. But being what some people call stubborn, I decided I had to do something about the out of control pity party I was staging every day. I decided to pick up every crossword puzzle I could find and even if I couldn’t complete them, I’d use them as a game to teach myself how to write with my left hand. 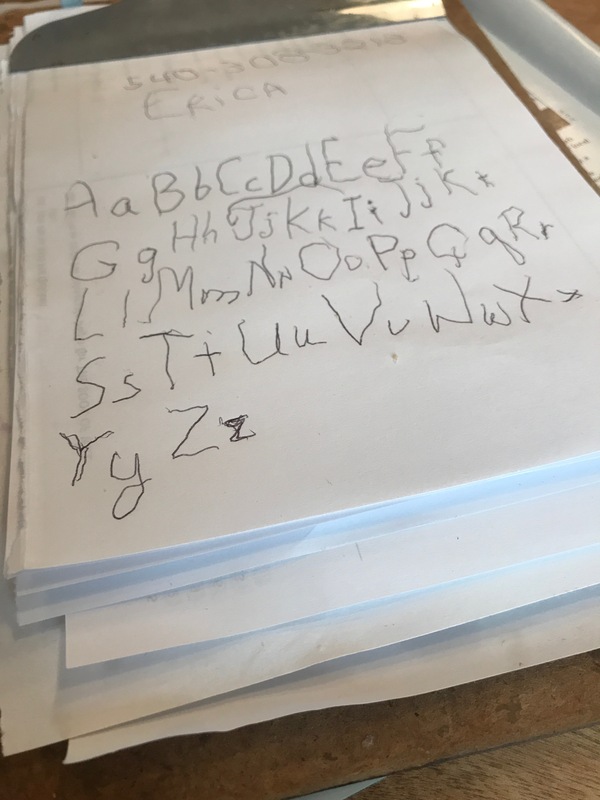 I started printing out the alphabet with both capital and small letters every day with ole lefty. I wish I had saved the early attempts to show you, but I think you can still see the progress that I am making in these photos. By the time the sling comes off in 3 to 4 weeks, I will be ambidextrous as far as writing is concerned. Will I continue to use my left hand to write? Maybe, maybe not. If I don’t it will have been one of the challenges that I gave myself to get rid of my stinking thinking during my recovery. Being a writer with a head full of ideas, typing with one finger isn’t any fun. It abounds with frustration and anger. So I’ve started dictating my thoughts to my computer. That would be great if the computer understood and spelled everything I was saying correctly. But it doesn’t. Therefore I’m learning to pronounce my words very carefully. Still there are lots of corrections to make. So as I dictate I use my left-hand and fingers to delete and correct what I’m writing. But that is not the only problem. When my shoulder is completely recovered and I can go back to using my right hand I will be back in the flow where ideas flit about like fireflies on hot summer evenings. The flow of words I put down on paper by dictating are choppy and not particularly well written. I am told the reason for this is that these two ways of writing use different parts of the brain. But you know me. I want to write when I want to write and to get out the words as often as possible. For someone who keeps a daily journal it becomes problematic in that I am not processing my thoughts as freely as I usually do. But I’m doing the best I can and for a little bit everyday try to express myself in a new way without getting too frustrated. This is my effort for today. My brain is way ahead of where these words are coming from. But what I have written here helps soothe the path to full recovery of both my shoulder and my frustrated ego. The big news here this week is that the rain came and finally we are no longer in a mild drought situation. But the even bigger news is that next Saturday, I will be in taking part in a Memoir Panel Discussion at the Gaithersburg Book Festival in Maryland. I’m excited. 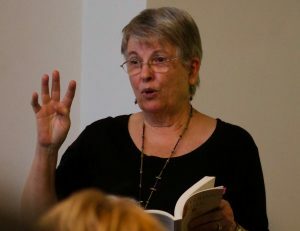 Joining me on the panel will be fellow She Writes Press sister, Betty Hafner. 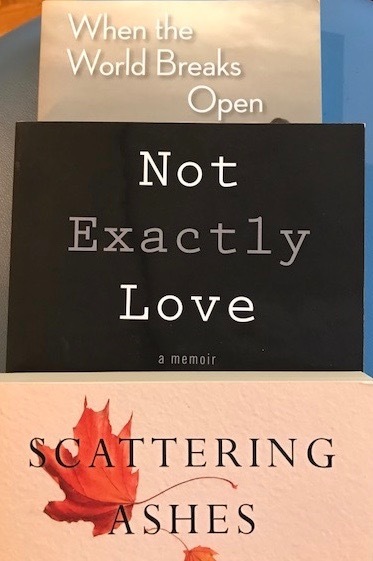 Betty’s memoir, Not Exactly Love, published last year, is about her first marriage and the unpredictable domestic violence she lived with for far too long. For the multitude of women and men who live with physical abuse at the hands of their spouses, this book is a poignant guide revealing how Betty took back her own life, leaving the abuse she suffered behind. It’s a moving narrative filled with the stuff of real life. I found it hard to put down. Seema Reza, author of another page-turner, When the World Breaks Open, published by Red Hen Press in 2016, will join us in our discussion about writing memoir and abuse. With raw honesty, Seema examines her own role in her dysfunctional and abusive marriage, as she struggles with fear, regret, love, loss, and motherhood. Written as a series of short essays, poems, and notes to herself she brings to life the lessons she has learned and the infinite wisdom one finds amidst suffering. 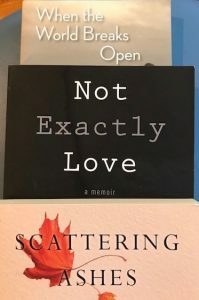 My own book, Scattering Ashes, A Memoir of Letting Go, about living with my mother during her last seven years of her life, sheds light on how domestic abuse by parents effects their children throughout their lifetimes and how the chain of abuse within a family can be stopped. If you are in the area it would be wonderful to see you there. The panel will start at 11:15 AM and run until 12:00 PM, followed by a book signing. Go to the Gaithersburg Book Festival’s website here for directions and a schedule of other interesting book events. Woodland Phlox blooming in my garden now. Last week I said I’d be away and wouldn’t be posting a blog today. I’m supposed to be in a quiet location about an hour from here at a five day insight dialogue meditation retreat. Unfortunately I came down with the flu the day before I was supposed to leave and have been in bed ever since. I don’t do flu shots, but this dance with this nasty bug has me wondering if I should get one next fall when they are once again offered. Except for a nasty cold after the first of the year, a UTI several weeks ago on a Saturday that took me to the ER, I’ve had a healthy winter. The hospital has a new system where you if you need to go to the ER you log in on line before you leave your home. They will tell you when to be there. I called at 3 PM and was told to be there at 5:30. I expected immediate treatment, but sat in the waiting room until 9:30, filled with folks, young and old with the flu and the very nasty Norovirus. I know that is where both Bill and I picked up this bug that has had both of us in bed for days. While Bill is feeling much better and has slipped out for groceries, he still finds a need to take care of himself and not overdo. I was told of someone who had this bug for 3 weeks, because he went back out into the world too early and got sick again. I was told I’d be welcome at the retreat even a few days late, but though I am feeling somewhat better, I’ll take no chances and just stay put for the next few days. The retreat is over on Wednesday. No way am I going to make it. For me it’s been five days of misery, yet despite my fight with a fever, a constant barking cough, a burning sore throat, and extreme dizziness, my head has been filled to the brim with writing ideas. On Saturday, I decided to put two nonfiction books aside that I’ve been reading. The first was, Dreamland: The true Tale of America’s Opiate Epidemic, by Sam Quinones, which is hard enough to read when you’re feeling well. I’m not at all sure that I will ever finish it. It’s just too damned depressing. The second one that I truly love and will absolutely finish is, The Power of Off: The Mindful Way to Stay Sane in a Virtual World, by Nancy Collier. Who needs nonfiction when you can’t stand up straight, walk across a room without weaving back and forth like a drunk, and can’t breathe? Both of those books are about addiction and though I don’t and never will take opiates, being addicted to the internet and the iPhone is something I admit to and resonate with. You’ll hear more about this in future posts. I find America’s addiction to all things technical an alarming addiction and a difficult one to break. After putting those two books aside, I picked up Christina Baker Kline’s, new novel, A Piece Of The World. I loved her book, Orphan Train, and heard her talk at the Virginia Festival of the Book just a few short weeks ago. Her use of language, descriptive passages, and narrative based on hours of research into Andrew Wyeth’s relationship with Christina Olson, the woman in his most admired painting, Christina’s World is phenomenal. I’ve only just begun this book and my eyes get tired easily, so I read for short stretches. But her beautiful words tumble through my mind as I cat nap between putting the book down and picking it up again. Yesterday, feeling better than I have in a few days, but still a bit fuzzy headed, I picked up, Natasha Trethewey’s book of poems, Native Guard. It won the Pulitzer Prize for Poetry in 2007. I heard her talk about her work and poetry at a journaling conference I attended last May. The child of a racially mixed marriage, her poems “confront the racial legacy of her native Deep South.” Like Kline’s words, Trethewey’s verse is beautifully written, phenomenally descriptive of both place and emotion, leaving no doubt as to where you are and exactly what is happening. With those two books tucked under the covers with me, I became inspired. It was the first time in a long while that I felt that I absolutely had to write something right then and there, as often happens when I read the words of exquisite writers, like these to women. And realizing that April is National Poetry Month, I got it in my head to write a poem a day for the rest of the month. I missed April Fool’s day, because I was so sick, but maybe I can write two poems another day to make up for missing the first day of this new month. I immediately wrote the following poem. Have you ever had the urge to write when you were sick or otherwise engaged? Spring is here a whole month early. Like many other locations it’s been a warm winter. Some one told me they found a tick on their dog yesterday. We’ve had several near 80 degree days, but mostly the warmest have been in the low 70’s. 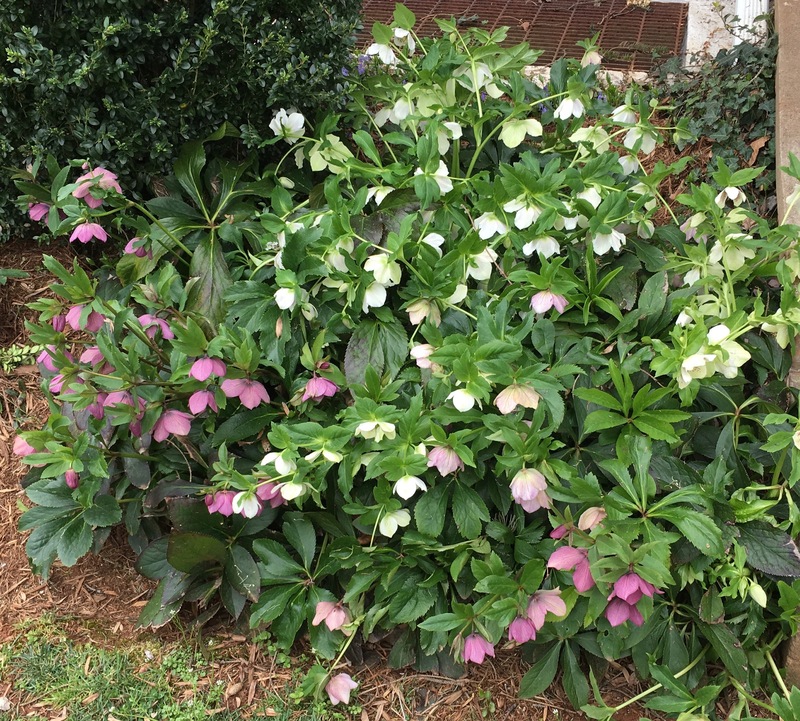 Forsythia and magnolias are blooming, along with pears and cherry trees. The last two nights have been well below freezing and there was an article in the paper about how this freeze may effect the peach harvest here in Virginia. Local growers are using fans to keep the air moving around their orchards, but they admit there’s little they can do except pray since climate change is here to stay. I can’t imagine a summer without the sweet juice of peaches running down my arms as I consume them nonstop. Peaches are the best thing about the warmest months and I look forward to them all winter long. 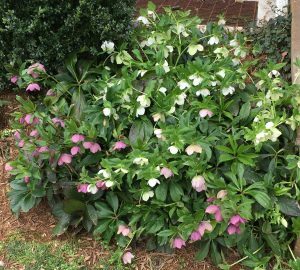 My hellebores are blooming spectacularly this spring. On these frosty mornings they sometimes keel over looking like they’re dead, but once the sun is up and warms the air a bit, they stand taller than ever. 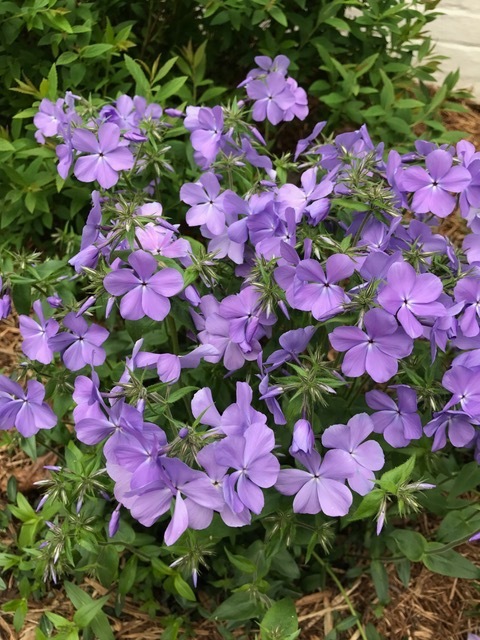 They are one of my favorites because they bring color to the garden in February when I need a sign that winter is almost over. 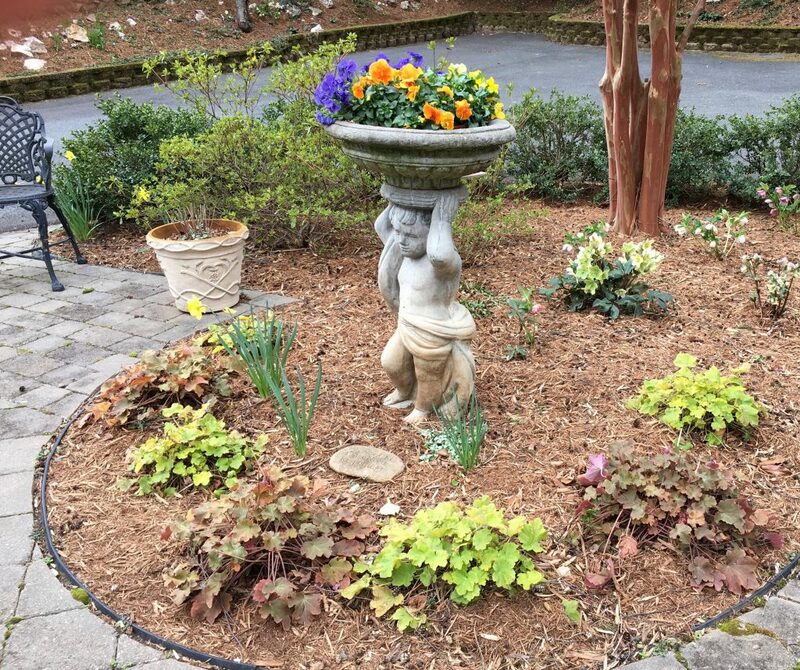 At this time of year I do a quick garden tour every day to see which plants are slowly rising above the thick layer of mulch that was put down last month. Orange breasted male robins are fighting over females and on my early morning walks the air is filled with birdsong that brings me joy. Tis the season of rebirth. On my afternoon walk yesterday afternoon I noticed that someone in the neighborhood had tapped one of their maple trees hoping to gather enough sap to boil down for maple syrup. My brother Reid, now deceased, used to tap a grove of maples in New Hampshire every year when the days warmed above freezing and the nights brought freezing temperatures. He boiled the sap down in large pans over an open fire, coming indoors at the end of the day smelling of fresh air and wood smoke. My pantry was always filled with mason jars of his maple syrup. One year he supplied me with so much that I put it in the freezer thinking it would last longer that way. This past fall I used the last of the pint jars of his amber gold and when it got down to the last quarter of a cup, I wanted to tuck it back in the freezer as a way to keep him near me. Reid has been gone now for seven years. I felt that if I used the last of his gift up, he would be gone for good. But then I made a batch of buckwheat pancakes and used it up, knowing that if I carry him in my heart he’d be with me forever. Those last few drops were a celebration of his life. Along with the plants, I’m coming to life again too. My burn out is easing and I’m longing to be out in the garden every day. I found myself writing a poem last week for the first time in years. I’m thrilled to be at it again, adding to my series of poems about Mrs. Heartwell, who is part me and every other woman in the world. She’s vulnerable, brave, strong, sensitive, and filled with love. I plan on working on this collection about her that I started almost twelve years ago and make it into a chapbook some day. I may start sharing a few from time to time but for now am sending out some of the series to see if I can get them published in a literary journal or two. Although I enjoyed writing my memoir and using well constructed sentences, I absolutely adore using words sparingly to paint short writings that are free of garble, yet full of power. Do you find yourself coming back to life at this time of year? Book Reading and Signing, September 30, 2016, New Dominion Bookshop. Photo by Mark Rough. Scattering Ashes, has been launched!! I had a great crowd on Friday night and the question and answer period could have gone on forever, but having done a few poetry reading in the past, I know it’s good to stop and leave the audience wanting more. From the calls and notes I’m receiving from those who were there, my reading and book talk were very much enjoyed. Writing my book and getting it published has been a humbling and educational process. But I need to take some time to let it settle before I can truly say what it means to me. I loved the whole experience for sure, but I want to think about what the easiest part was, the hardest part, and how it will affect me in the future. So far I’ve noticed that my sense of self-esteem has hit the top of the charts. I did it. I really did it. Who’d a thunk this highly sensitive, shy, introvert would actually share the details of her life with others in a book and enjoy doing so? How do I separate myself as an individual who wrote a book from the book itself? Am I the book or am I still Joan, who happens to have written a memoir? Why does it matter? There are so many questions rolling around in my noggin and I haven’t had time to get to the end of the list just yet. Needless to say, I will be writing about all of this in coming blogs. In the meantime check out my newsletter which was published yesterday morning. I’m giving away two signed copies, of Scattering Ashes, to those who send a comment and reply to my newsletter. I’ll be choosing the winners at random. If you haven’t yet subscribed to my newsletter now is a good time to do so. You can sign up at the top of this page on the right. Here’s to life’s journeys and the learning! My love and best to you all!